With their contemplative demeanours, they seem destined for each other. 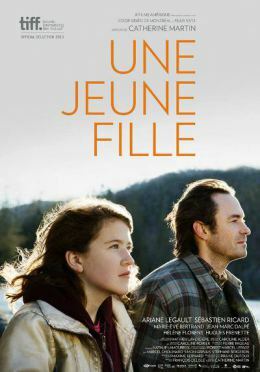 A film about a young girl running away from pain and finding love, Une jeune fille is set on the beautiful Gaspé peninsula of Quebec. When Chantal’s (Ariane Legault) mother passes away, she packs her backpack and takes the first bus to Gaspé, motivated by a photo of a beach that her mother gave her just before she died. Brave, quiet, and determined, Chantal spends her first couple of days in Gaspé sleeping under a bridge and wandering in search of the beach in the photo. She has run out of the little money and food she had brought with her when Serge (Sébastien Ricard) comes across her sleeping on the side of the road near his house. Although the love story in this film is very slow to develop, Chantal and Serge have an instant connection. They are similarly quiet and solitary, and they seem to understand each other without having to say much at all. This subtlety adds so much beauty and depth to the film. After spending the night in Serge’s spare room, Chantal proposes that she could stay and work on his farm to earn her keep. Serge is a mysterious character and seems almost annoyed at her presence sometimes, but he defends Chantal when his sister questions him about her. They work together in silence most of the time, the tension is palpable, but slowly they learn a bit about each other. Serge loves his classical music records, his woods, and his solitude. His way of life comes under attack when his sister tries to convince him to sign a deal to sell the woods. She’s not interested in them at all and simply wants to cash in. Chantal understands Serge’s love of the woods and having been alone for so long, Serge eventually realizes how much he values Chantal’s company. With their contemplative demeanours, they seem destined for each other. The scenery of the Gaspé peninsula, subtle, melancholic performances from Ricard and Legault, and a slow burning relationship make this a very engrossing film.